At Tinker Tin Trailer Co. we've built a business around unique vintage Trailers! Nothing gives us a thrill like trailer picking' and bringing one of these pieces of history back to life! A majority of the vintage camper trailers in our fleet have been restored back to their originally glory and continue to serve the purpose they were originally manufactured for: camping. That being said, a lot of the members of our fleet have also been repurposed for different kinds of adventures! With this 1950's chapel on wheels you'll never have to choose between camping or missing Sunday morning church service again! Growing up Catholic we've spent a lot of time in churches. We've also spent a lot of time out camping in "God's Country" ... What could possibly get you closer to Jesus than combining the two like this 1950's camper church did?! This one takes us back to the days when marketing was done right. Before "influencers", Instagram and Facebook was how we learned what was cool... All Levi's needed to do was create an amazing, traveling puppet show rodeo trailer and ALL the kids were begging their parents for a new pair of Levis! The original "mobile phone" concept.... As your viewing this blog from your iPhone, we hope you'll take a moment to appreciate the times when "mobile phones" weren't able to fit in your pocket, but had to be pulled by your car instead. This one's a mobile show room on wheels for customers to come inside and view new products! This is one of our favorites! 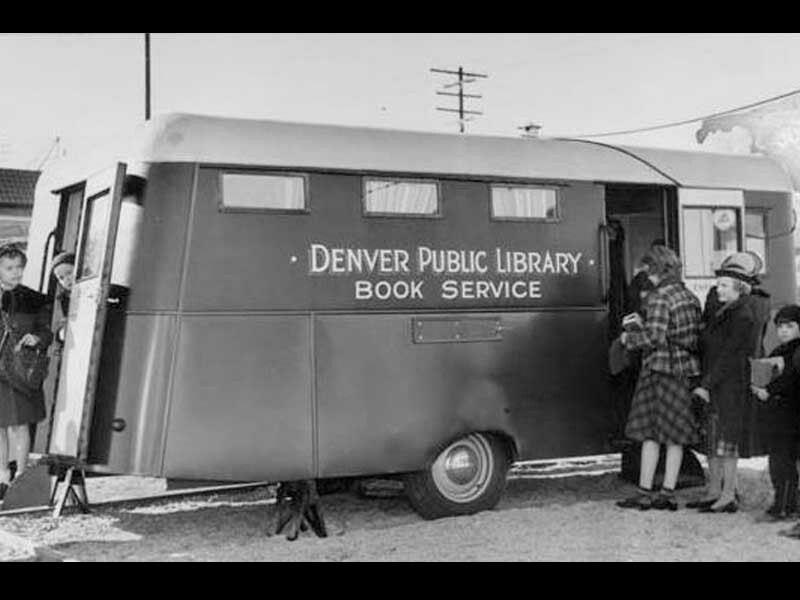 There is no excuse not to read when the library can come to you! We don't know who won or lost this election, but it's safe to say they would have had our vote! Here's a few vintage trailers from our fleet we've restored and repurposed for different adventures! We've got vintage bar trailers... we've got vintage photo booth trailers... and we've got vintage vending trailers! We've got lounge trailers, tipis, tents and all kinds of other quirky ideas up our sleeve for our next fun vintage trailer to, and we can't wait to share them with you all! Our 1958 Roll - O - Vend vintage trailer was manufactured in 1958 as a vending trailer for Pepsi Cola to sell sodas out of! We restored it to its original glory to be used as a bar and vending trailer! This vintage trailer can be rented as bar trailer at events but is also available for long term leases for branding and marketing campaigns! Our 1953 Crown vintage photo booth trailer makes every wedding, party, and marketing event more fun! Offering guests a custom takeaway photo strip with your even name or company logo, guests walk away memory from every event we roll it into! Our 1948 horse trailer bar makes every event more fun! This bar and vending trailer can also be customized with your company's branding and a styled lounge to create the perfect experiential marketing experience! Our Sidecar Shasta bar turns is a head turner.... with its folding window, modern design and sleek paint job - it fits in wherever it goes! We partnered up with our favorite craft cocktail catering company, Sidecar Cocktail Co. to make sure that only the best drinks are served out of her window! This rare 1948 Barrel is one of only 3 known to exist! We converted this unique camper into a one-of-a kind "serve yourself" style beer trailer complete with 2 tap handles, holding capacity for 2 full size kegs, built-in ice chest on tongue of trailer for grab-n-go beverages, and drop down shelving on the side of the trailer perfect for placing glassware or drink dispensers!